EAS-2x2-21-1 6' x 6' 1 21"
EAS-2x2-66-1 6' x 6' 1 66"
EAS-3x3-21-1 9' x 9' 1 21"
EAS-3x3-21-2 9' x 9' 2 21"
EAS-3x3-66-1 9' x 9' 1 66"
EAS-3x3-66-2 9' x 9' 2 66"
EAS-4x4-21-1 12' x 12' 1 21"
EAS-4x4-21-2 12' x 12' 2 21"
EAS-4x4-66-1 12' x 12' 1 66"
EAS-4x4-66-2 12' x 12' 2 66"
EAS-9x4-21-2 27' x 12' 2 21"
EAS-9x4-66-2 27' x 12' 2 66"
What a hassle it is to have to walk all the way around large machinery to get to the other side - especially if it's part of a long production run, and a sorter on the far side needs some tweaking before the next load. And, what about having to run back to admin office space to complete paperwork? You need to be supervising that latest production run, but the boss wants reports pronto! Imagine being able to simply walk up and over that machinery. Or being able to observe what's happening on the floor and still get your reports and other paperwork done. 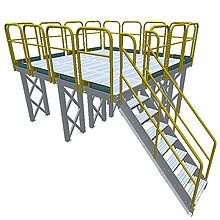 The solution is to take advantage of your vertical space by going over obstacles instead of around, and to make production and operations more efficient by creating additional work space within work zones. 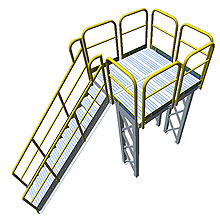 The solution is modular work platforms. 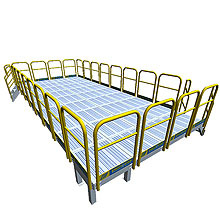 Go over pipes, conduit, tubing, and conveyors. 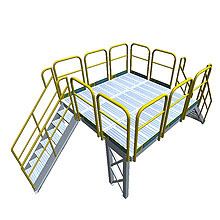 Make a mezzanine height work platform quickly and easily with bolt-up installation. 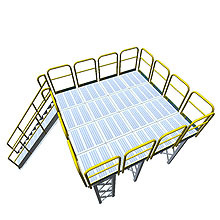 Take advantage of empty space above equipment and machinery for light storage, production vantage points, maintenance access, even desk space so supervisors can be present but not standing around. 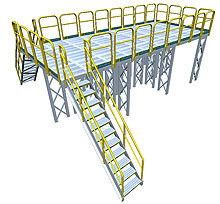 Each platform consists of a combination of stair, handrail, platform, and support tower units assembled to specified clearance heights and depths to create the exact configurations needed up to 102" of clearance and down to as little as 12" below the platform. 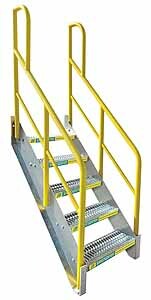 With quick bolt-up and anchor installation, along with endless re-configuration possibilities, how can you afford to be without modular work platforms?